The 2019 Beneteau Swift Trawler 47 is a new sibling in a very successful long-range cruising line-up. 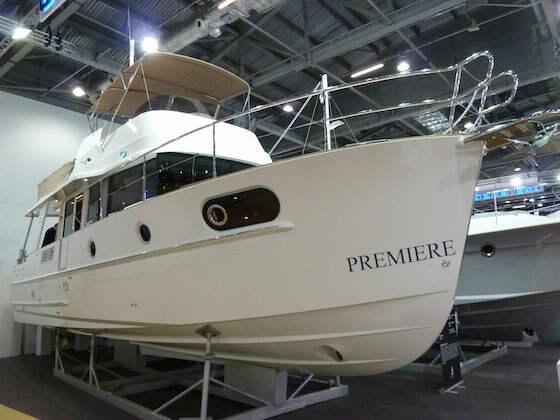 French builder, Beneteau, knows they tapped into a good thing with their Swift Trawler (ST) line and so new models and lengths roll off the production line nearly every year. At the most recent Fort Lauderdale Boat Show, the Swift 47 made its debut and the crowds came to check out this “fast trawler”, which may be an oxymoron but in the best way possible. Trawlers are boats you look to when contemplating long-distance voyaging at 8-12 knots. They’re long-range, fuel-efficient models aren’t built to plane or get anywhere fast. But that’s where Beneteau turned the trawler moniker on its ear. The top speed of the Swift Trawler 47 is 27 knots with the standard (and only) Cummins 425 HP engine package. She’s built on a slippery hull that gets to planing speed in seven seconds so she has the giddy-up to get out of the way of an incoming storm. At standard trawler speeds of eight knots, the ST 47 has a 900+ nautical mile range which will keep you coastal cruising around the US and out to the Bahamas with no need for a pit stop. The ST 47 comes with shaft drives. Pods aren’t offered primarily to keep the design affordable. However, with two large props and a bow thruster, you can dock her easily in a cross breeze. In case your docking situation is ultra-tight, stern thrusters are optional. The Swift Trawler 47 has a top speed of 27 knots with the standard (and only) Cummins 425 HP engine package. More space, more power and a greater range define this model, one of five in a line that ranges from 30 to 50 feet. Designer, Pierangelo Andreani, has kept the newest sibling simple, practical and comfortable, a signature combination of this design. There are three ways to board the ST 47. The standard way is via the large swim platform that has pop-up chocks to carry a tender and has a hydraulic option to make boarding for swimmers easier. A second way is through the starboard side hull door that is in line with the helm. This means that a solo driver can hop off quickly to manage the dock lines. The third option is via a ladder at the split bow pulpit for those awkward docks that allow neither side nor aft boarding. Beneteau has given some thought to the use of this design, making it accessible to the whole family including those less mobile. The double transom gate is wide enough for a wheel chair and the swim platform, cockpit and salon are on the same level which is unusual. The ladder to the flybridge is to port and can be pushed on rails up against the deckhouse when not in use creating even more room in the cockpit. Calling this stairway a ladder is a disservice however, because when deployed, the wide treads are much more user friendly than a standard ladder. More space, more power and a greater range define this model. A bench seat spans the transom all the way to the starboard hull and an optional table makes this into an al fresco dining area. The overhang from the flybridge offers protection from the sun and rain and acrylic doors on the side decks divert the breeze so no matter how much it’s blowing in the anchorage, you’ll be comfortable when seated aft. Speaking of the side decks, the ST 47 is asymmetrical with the starboard deck wider than the port. The starboard deck even benefits from the flybridge overhang for weather protection. Both sides are bordered by waist-high bulwarks so getting around under way is safe. On the bow, there’s a generously-proportioned sunpad with a removable panel to allow sun and ventilation into the master stateroom below. This will make a lovely getaway from the crowd where to curl up with a book or work on a tan. 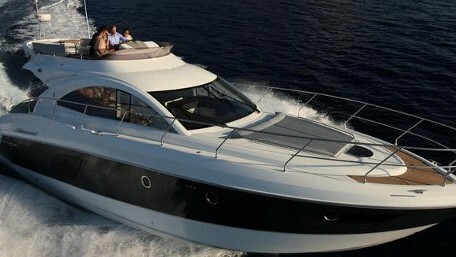 The third exterior space is the flybridge with additional lounging space and a wet bar. Options include a grill, refrigerator and sink. Forward are two L-shaped settees on both port and starboard and a teak fold-out table. Another option is a hardtop with an integrated electric sunshade. Eight will be very happy here for sundowners. 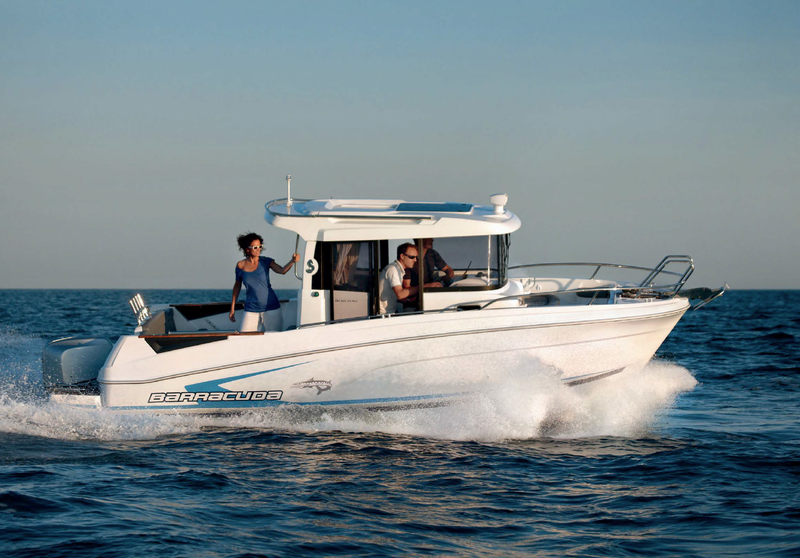 The outside helm is on the centerline with twin Raymarine 12-inch displays just ahead. The autopilot control is to the left with engine and thruster controls to the right of the wheel. The captain’s seat swivels and the companion lounge may be converted to face forward. In fair weather or on a slow sightseeing cruise, you’ll want to drive from here where the visibility is excellent forward and to the sides. An optional rear-view camera will keep tabs on what’s happening on the swim platform or when backing into a slip. The lower helm, located in the "pilothouse," just forward of the galley, provides visibility in every direction. In inclement weather or on long passages, the lower helm will be the choice. Just forward of the galley, the “pilothouse” offers good views in every direction. As above, twin 12-inch Raymarine touchscreen displays are on the dash with switches, autopilot and rudder indicator below. The destroyer-style wheel is on the centerline. The wide helm seat has a flip-down bolster and enough room for two tiny people or one large one. Just aft of the pilothouse is the L-shaped galley with twin sinks, a propane stovetop with a separate oven and an optional microwave. Refrigeration drawers are next to the sink, which is ideal when preparing meal. There’s plenty of stowage for tools of the trade but you’ll want to go light on the foodstuffs, re-provisioning along the way on a coastal cruise. The galley and salon are nicely integrated into a great room. The L-shaped dinette is to starboard with a folding table. In a matter of seconds the sofa is converted into a slim double bed where two cozy people can spend the night in semi-privacy thanks to the curtain on an overhead rail. A sliding glass door aft opens to the cockpit and extends the sightlines to make the living spaces seem larger. The ST 47 has a three-cabin layout, which you reach via the companionway to starboard of the helm. On the landing that leads to all the cabins and the day head, there’s room to install an optional washer/dryer. The owner’s stateroom is in the bow with a double bed on the centerline and shelving on either side. Hull windows with opening ports and an overhead hatch make the space bright, airy an inviting. Stowage space is also under the berth and in a hanging locker. The master head is split with the toilet and sink to port and shower compartment to starboard. Two guest staterooms offer accommodation for four more. One cabin has a double berth and is tight on headroom so it’s perfect for kids. To port is cabin with twin berths that may be converted to a double. There’s more headroom here it will serve adult guests well. Both of these cabins share one wet head that’s also the day head. It’s likely that a traveling couple will use one of these cabins for stowage and the other for guests. 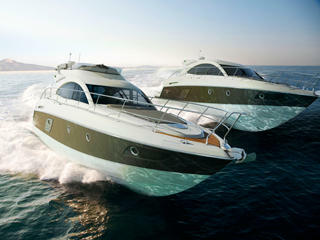 For those times when the boat is packed, two more can sleep above in the salon for a total of eight. The finish is clean, practical and quite presentable. Renewable Alpi wood provides durable surfaces that can stand up to daily wear and tear and padded vinyl finishes provide an upscale touch. Optional equipment may be installed to make a retirement cruise ultra comfortable and include a watermaker and TVs for all the cabins. There’s no roughing it on the ST 47 and that’s all for under $800,000 reasonably equipped. 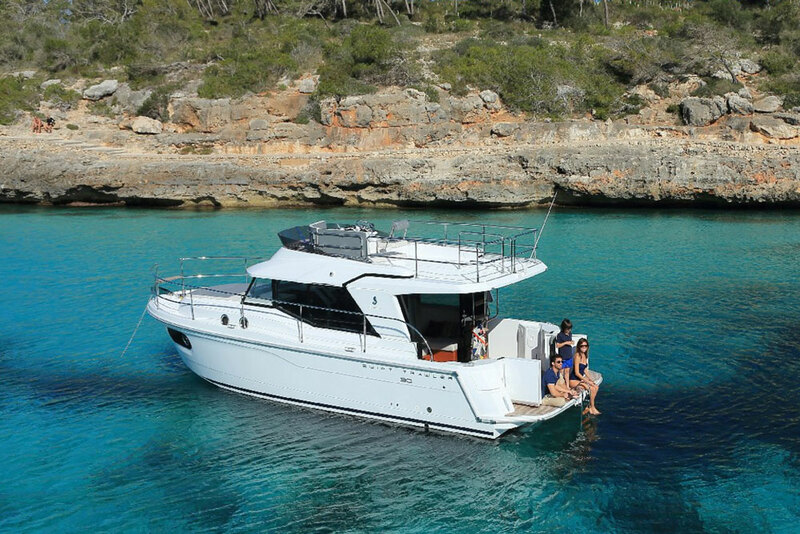 A few years ago, Beneteau managed a very successful public relations campaign by doing the Great Loop on their Swift 34 in just over thee months. It got a lot of visibility and showed what their smallest trawler (at the time) could do. The Swift 47 is more than capable of the same and to mix up the PR, a different promotional journey could wind up the Inside Passage to Alaska. 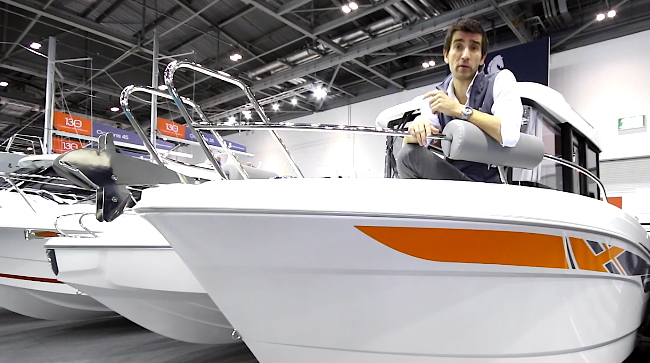 A heater is optional and the trawler’s fuel efficiency would make for an affordable trip. Heck, if Beneteau doesn’t do it, why don’t you? 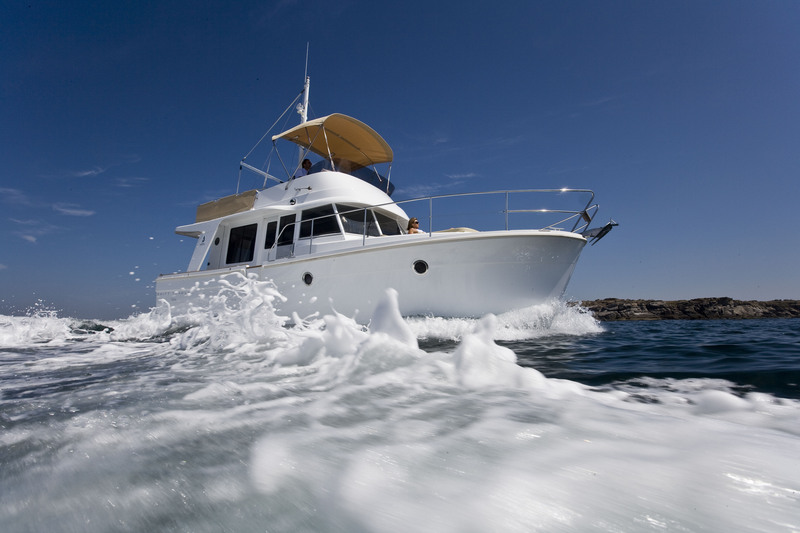 See Beneteau Swift Trawler 47 listings, or read a similar review on the Beneteau Swift Trawler 44.